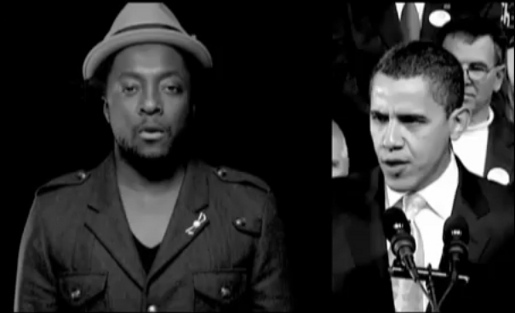 American hip hop musician, songwriter Will.i.am, founder and lead singer of Black Eyed Peas, has produced a music video for his political support song for Barack Obama, lending supporting to Barack Obama’s political speech during the New Hampshire campaign, “Yes We Can”. The song is online at www.dipdive.com. The Yes We Can song was recorded at Ether and Record Plant, Los Angeles, on January 30 and 31, 2008, produced by will.i.am. Guitarist was George Pajon from Black Eyed Peas. will.i.am appears with a large cast of actors and singers: Adam Rodriguez, Alfonso Ribeiro, Amaury Nolasco, Amber Valletta, Auden McCaw (Amber’s son), Anson Mount, Austin Nichols, Aisha Tyler, Bryan Greenberg, Cliff Collins, Common, Derek Watkins, Ed Kowalczyk (Live), Enrique Murciano, Eric Balfour, Eric Olsen, Esthero, Fred Goldring, Harold Perrineau, Herbie Hancock, Hill Harper, John Legend, John Schaech, Kareem Abdul Jabbar, Kate Walsh, Kelly Hu, Maya Rubin, Nick Cannon, Nicole Scherzinger, Sam Page, Sarah Wright, Scarlett Johansson, Shoshannah Stern, Taryn Manning, Tatyana Ali, Tracee Ellis Ross. Filming was shot by director Jesse Dylan via cYclops Films/Form, with producers Mike Jurkovac and will.i.am, line producer Carol Cohen, production supervisor Matt Harrison, director of photography Rolf Kestermann. Editor was Terrence Biff at Rock Paper Scissors, with assistant Anton Capaldo-Smith, with producer Carol Lynn Weaver. Telecine was done at Rushes. We have been told we cannot do this by a chorus of cynics…they will only grow louder and more dissonant. We’ve been asked to pause for a reality check. We’ve been warned against offering the people of this nation false hope. But in the unlikely story that is America, there has never been anything false about hope. Now the hopes of the little girl who goes to a crumbling school in Dillon are the same as the dreams of the boy who learns on the streets of LA; we will remember that there is something happening in America; that we are not as divided as our politics suggests; that we are one people; we are one nation; and together, we will begin the next great chapter in the American story with three words that will ring from coast to coast; from sea to shining sea.